It was in the 1990’s that the Chausie Cat Breed was first created. Chausie cats are a hybrid, man-made species, created from the mix of wild felix chaus and domesticated felix catus. In everyday terms, wild jungle cats from south-central Asia were bred with domesticated house cats. This created large, active, social and generally friendly house pets. Similar breeds include the Bengal and Savannah cats. As one of the largest domesticated breeds, Chausie Cats can weigh in around thirty pounds and are generally fourteen to eighteen inches tall. That is a similar size to many medium dogs, for example a Schnauzer, so this isn’t an everyday sized kitty. Chausies have large ears and cougar-like facial features including an elongated snout. Apt jumpers, they can also use their slightly longer hind legs to spring up to six feet in the air. A shorter tail and a longer body are characteristic of Chausies, and they have a very distinctive tabby pattern that makes their short hair uniquely beautiful. The Chausie Cat Breed has roots in both the jungle and the home, and this has created a species that is both highly energetic and also highly social. Having room and time to play, as well as having caretakers that are around more often than they are away makes for a perfect Chausie Cat home. Chausies that are too often left alone will become unhappy, and this can even lead to destructive behaviors if not addressed. 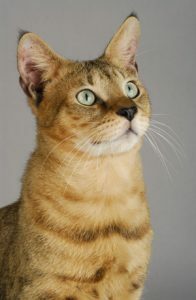 The Chausie Cat Breed, while otherwise relatively low maintenance, requires a specific diet. Their digestive systems cannot properly process plant matter, and if their food contains gluten or veggies it can lead to malnutrition. That being said, it is important to feed Chausies only meat-based diets as often as possible. This extra attention will ensure a healthy, happy Chausie cat. Similar to other house cats, Chausies usually live to be between twelve and fourteen years of age. This is an important piece of information for perspective owners, as they will need to commit to a decade plus of care and play if they select this sweet but high energy feline. 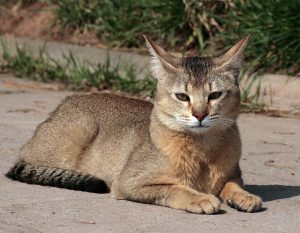 The Chausie Cat Breed is short haired, but in order to keep their coats smooth and healthy they should be brushed once per week. They should be fed a completely carnivorous diet and should always have access to their own fresh water. As they are social, they also require daily play and social interaction in order to maintain their energetic and loving personalities. Chausies are caring and social creatures, but were initially derived from wild beasts. Their possible violence, even if it is meant playfully, combined with their large size, means that families with small children should carefully consider the purchase of a Chausie. It isn’t fair to the children or the animals if the living situation is compromised. Only experienced pet owners with the right amenities and resources should look in to the purchase of this breed of cat.